Wheatgrass is extracted from the sprouts of hard red winter wheat harvested at the stage immediately prior to the appearance of the first true jointing of the plant stem as it grows from seed. Wheatgrass can be traced back in history over 5000 years, to ancient Egypt and perhaps even early Mesopotamian civilizations. 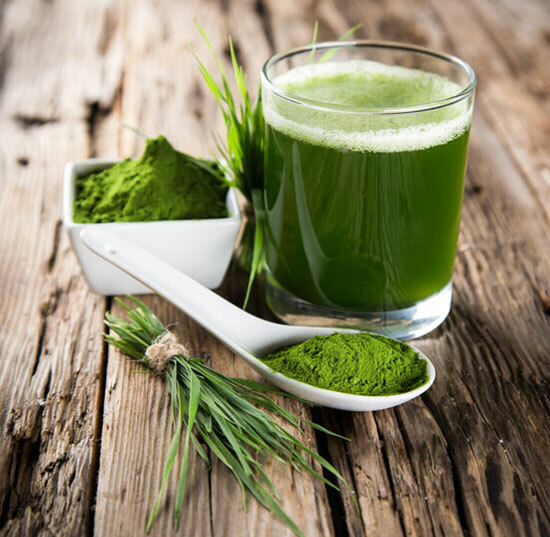 A primary ingredient in wheatgrass is chlorophyll that gives the juice its distinctively green appearance. It not only possesses chlorophyll, but, amino acids, minerals, vitamins, and enzymes. Wheatgrass is a complete protein in that it contains all amino acids. Wheat, or its ‘relatives’ means any kernel belonging to the ‘wheat’ family, is the only seed known to have the ability to take up 90 or more minerals during its life cycle in its germination process — which is in effect, close to all known minerals. This means that if grown with availability of nutrients, in the proper environment, wheatgrass will be very nutrient dense due to its incredible genetic design. Wheatgrass is a complete food and is commonly referred to as the “king” of land vegetation. Wheatgrass juice / powder is extracted from wheatgrass sprouts, before the wheat seed begins to form, therefor it is gluten-free. Add it to your favourite smoothie, water or fruit juice to make an alkalising health drink.